It's in the kitchen- Wednesday. Makin' Lasagna Soup. | A.B.E. Remodeling, INC.
this soup. Whatever the case ENJOY YOUR DAY and MAY THE FORTH BE WITH YOU. Heat large Dutch oven over medium high heat. Add beef and onion and cook, stirring occasionally until beef is browned. Add garlic and red pepper flakes and saute for 30 seconds. Drain off any excess fat. Add Prego Sauce, 6 cups chicken broth, crushed tomatoes, tomato paste, balsamic vinegar, sugar, spices and lasagna noodles. Bring to a boil then reduce to a simmer until lasagna noodles are tender, stirring occasionally (approximately 20-30 minutes). Discard bay leaf and stir in heavy cream (optional) and 2-4 cups chicken broth to reach desired consistency. Garnish individual servings with desired amount of cheeses. 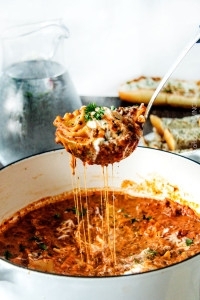 *I love lasagna noodles in this recipe - they are slurpilicious! You can also replace the noodles with 2 1/2 cups uncooked small shells if desired and simmer for less time.